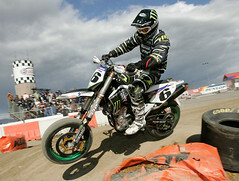 Following the 2008 season, it was uncertain where the former AMA Supermoto Champion Mark Burkhart would land. With very short notice the stars aligned as Burkhart and the championship-winning HMC team aligned forces. A mutual friend, Larry Pegram, helped unite Burkhart and Mitch Hansen of HMC Racing. Welcome to Team Monster Energy Burkhart HMC Racing website. Please stop in to keep track of our adventure in 2009 Supermoto Racing.